From centuries till now if History had proved anything then it is that Evolution always wins and so do humans because we evolved according to the necessity of needs by inventing and discovering new methods, elements, technology etc. The result is that nothing is equivalent compared to past neither technology nor our behavior. But still, education is something which not changed much especially the method use to teach younglings. Although many educational institutes have focused to make their teaching style better relative past and that’s appreciable, but here we are talking about the Big picture so we need to consider not only the way education is given, but also with what technology it is served and today we have School ERP solutions to serve educational institutes to manage their activities and data. So what is School Management Software and why educational institutes need to implement them badly? Let’s Unravel it. 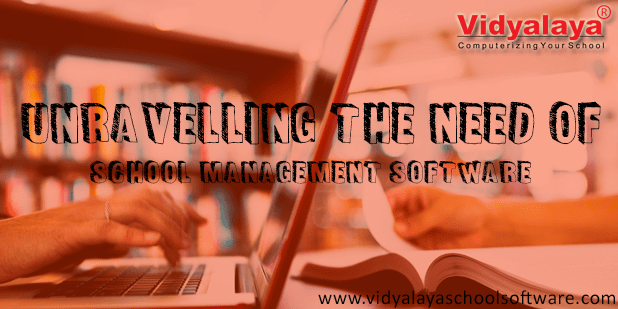 School Management Software are basically designed for the management of the school in order to govern the activities of campus effectively and sufficiently. But then how it is related to education? Because teachers should focus on teaching students rather than doing a time-consuming, clunky, and laborious process of making reports on different criteria, although it’s part of his/her work it’s too much time consuming. So here School Management Software come to the rescue. Educational institutes need School Management software in order to direct the control to all the activities and document easily, with the minimum human error. Now next question is what we can manage with Campus Management Software. You should ask, What we cannot do we that? School can manage students data, fees, exam, admission, certificate, resources, Payroll, Employee and student attendance and on top of that it also helps institute to became paperless. According to stats campuses using school ERP solutions helped them to reduce consumption of paper up to 90% and the reason they don’t need to settle the records on paper and release circular and notice on paper instead of that they do all this stuff virtually. Think about it if you get an option to store all this information virtually in computer that to systematically and revised order, how beneficial it will be for school, now they don’t need to manage piles of files and don’t need to take care of the maintenance of the place where these files are kept, work will be so simple. Moreover, it also helps to reduce communication barrier between School and Parents and helps parents to see all the activity of his/her child. So now all your workload is away and take care of an ERP software, school teachers can focus on delivering their best to students and teaching will be served with technology, and even parents can also track down their student performance. Isn’t that amazing?